Until I run out of past posts of pumpkin, I will be featuring a Pumpkin Parade on Thursdays. Today’s Parade features Breakfast in all its Pumpkin Glory. 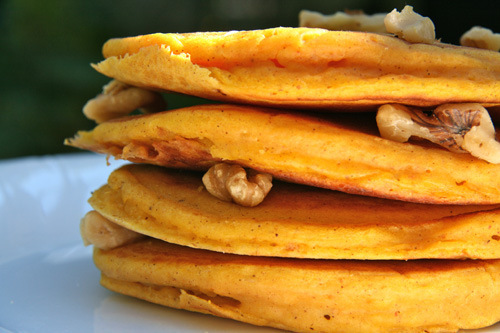 Personally, I think you need to go all out and make these oh-so-soft-and-fluffy Pumpkin Pancakes with Cream Cheese Dipping Sauce (aka frosting for breakfast)…I guarantee everyone in your household will be singing your praises when they bite into a stack of these babies. Categories: Breakfast, Pumpkin | Tags: cream cheese dipping sauce, fall breakfast ideas, fall brunch ideas, healthy pumpkin muffins, low-fat pumpkin muffins, pumpkin, pumpkin breakfasts, pumpkin brunch ideas, pumpkin coffee cake, pumpkin crumble cake, pumpkin muffins, pumpkin pancakes, Starbucks Copy Cat pumpkin muffins | Permalink.